Project obstacles and solutions: The Kentucky Intermodal Transpark in Bowling Green, Kentucky is the hub of economic growth in south central Kentucky. Due to the growth of businesses locating in the park, plus plans to relocate the airport to the area, there was a need for a connector route between US 31W and I-65. This included on and off ramps for I-65, US 68-80, and the building of seven new bridges. Van Meter Contracting was awarded this contract. Unique to this project was the active railroad line that runs into the park parrallel to US 68-80. Van Meter had to work around freight train schedules and keep the tracks clear during specified times. This was a challenge, especially on the bridge that crosses both US 68-80 and the rail line. IMI worked with Van Meter's crews to make sure concrete was delivered whenever the schedule called for it. This included pouring footings, piers, caps and decks at all times of the day and night. IMI supplied 7,500 yards of concrete for the bridges, ramps and walls on this project. 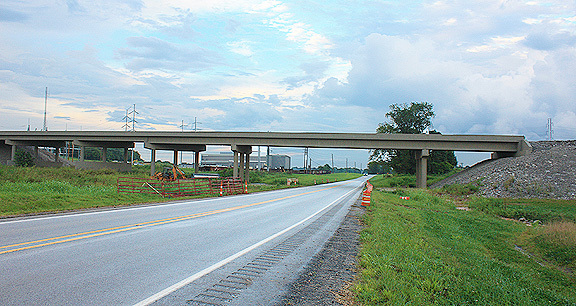 The I-65 Connector is scheduled to be completed in 2017. For more information on construction scheduling of concrete, contact the sales representative for the concrete plant nearest your location. Click here.